From left to right: William Marcuson, Enrique Castillo, Raymond J. Krizek, Frank Hamons and Interim Dean Herbert Rabin, who served as moderator. UPDATE:Raymond J. Krizek's closing remarks from this event are now available online. The Brooklyn/Curtis Bay area of Baltimore, in particular the Masonville cove on the Patapsco River section of the Chesapeake Bay, is the site of extensive damage caused by the improper disposal of hazardous materials and other practices. Citizens hope to see the cove restored and access to the water re-opened, a major undertaking that will require the unique technical--and leadership--capabilities of civil engineers. 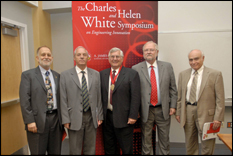 How those capabilities are developed and applied was the broad subject of the 2007 Charles and Helen White Symposium on Engineering Innovation, held on October 4 in the lecture hall of the Jeong H. Kim Engineering Building at the A. James Clark School of Engineering. Keynote speaker Enrique Castillo, University of Cantabria, Spain, developed a portrait of the civil engineer as problem-solver, based on the life and career of Raymond Krizek, M.S. '61 civil engineering. Krizek developed methods and technologies to prepare clay specimens for characterization by electron microscope, enabling detailed understanding of the "microfabric" of soils. His work supported the environmentally acceptable disposal of industrial slurries, including dredged materials, called for by the Environmental Protection Agency in the 1960s, as well as the injection of slurries into soil deposits to improve their characteristics. His work guided marine channel and port terminal construction projects and the combating of island erosion in the Chesapeake Bay and around the world, among other uses. Castillo cited not only Krizek?s technical accomplishments but his excellence as an educator and leader both in the U.S. and in Spain. William Marcuson, president of the American Society of Civil Engineers further developed the idea of engineering leadership? "the ability to see the future, describe it so others can share your vision and move with you by choice"?as a key quality exhibited by Krizek in his role as teacher and director of the ASCE Geo-Technical Institute, and required by all civil engineers, who must often work closely with the lay public. The final presentation was made by Frank Hamons, deputy director of the Maryland Port Administration's Office of Harbor Development, who described his job as "keeping mud out of the way of ships." Hamons stressed the importance of reliable data such as Krizek developed and the ability to use that knowledge to solve problems in the real-world. He described the process by which his office is engaging the Brooklyn/Curtis Bay citizens in the planning and execution of the Masonvile reclamation effort, and of the crucial importance for civil engineers of communications skills, patience, and the ability to see someone else's point of view. Raymond Krizek was inducted into the Clark School's Innovation Hall of Fame earlier that afternoon. View a photo gallery from the event online. For archived video of the symposium click here.